1. Through the first 22 games of the season, which Laker earns your HIGHEST grade, and why? King: The obvious choice has to be LeBron James. James has come in doing everything that could be expected out of the best player on the planet. Outside of a few missed free-throws here and there in key moments of the game, he has been as advertised. However, much like DJ, I have to rock with JaVale McGee. Nobody knew what to expect out of McGee on this Lakers squad. While he was successful with the Warriors last season, he did not see the floor for an extended amount of time as Steve Kerr was often playing musical chairs with his front-court last season. Now, McGee is being asked to be the premier anchor and heartbeat of an entire unit defensively when on the court. All he has done to answer that is swat away a league-high 62 blocks and second in the NBA in blocks per game. It was clearly obvious how important he was in the beginning portion of the season with the Lakers lack of depth behind him, however, the Tyson Chandler addition has alleviated those concerns for the time being. Having him on the court makes the Lakers a better team hands down and he has proven, unlike years past, to handle a good chunk of minutes averaging 24.3 MPG, his highest mark since the 2011-2012 season. If McGee keeps it up two things will happen at seasons end. 1. The Lakers will want to extend him. 2. McGee will be named to the First-team All-Defensive unit. Boyer: Is there an answer to this question other than LeBron James? In his 16th NBA season and first with the Los Angeles Lakers, James is averaging 28.1 points per game, which is top-five in the league, and he’s played an intrinsic part in shifting the competitive tide for one of the most iconic sporting franchises in the world, almost single-handily transforming the Lakers from the lottery team they’ve been for the better part of this decade to a team that seems as if they’ll be vying for one of the Western Conference’s hotly contested playoff spots all season long. For a soon-to-be 34-year-old man with the amount of mileage he has on its body, it’s been astonishing to watch how James has responded to the burdens (propping the Lakers back up to a championship level in a rugged West and facilitating the development of the youngsters to name a few) he inherited the moment he decided to make Los Angeles his new basketball home. James for sure earns my highest grade, and his greatness makes it difficult to believe that it’ll ever change at any juncture this season. Allen: People will call me crazy for this but in all honesty, my choice is JaVale McGee. In my opinion, he’s been the most consistent player on this team thus far. James has been solid and I know that’s the player everyone is probably choosing but I feel that at times he’s coasting. There are certain times where he can take over and be aggressive and he sits back and I have to penalize him for that. McGee has been very consistent on defense swatting anything and everything he can get his hands on. He struggles against solid back to the basket scorers but I love what he has done thus far as a paint protector. 2. Through the first 22 games of the season, which Laker earns your LOWEST grade, and why? King: Brandon Ingram. Before I get an angry mob of Lakers fans at my front step, let me explain. There are a few small things that have ticked me off about Ingram this season. While it has been an adjustment period for all Lakers players this season with the blend of newly acquired veterans and young players, I believe the player to have been affected the most is Ingram. The first thing that has bothered me all season and I believe that many Lakers fans can attest to this is the continued reliance on Ingram not backing down small/weaker opponents when he is switched on them on offense. When in that situation, Ingram does it rarely but instead, he seems to prefer to rise above his defender for a contested jump-shot. Next, let us not forget the skirmish Ingram had with the Houston Rockets in only the second game of the season. While I like the firey side of what Ingram did, he still decided to put his anger above the team and would get suspended the next four games, which the Lakers would go 2-2 in his absence and could have beaten the San Antonio Spurs (twice) had Ingram played. Do not get it twisted, I believe there are a lot of players that need to step up their game and have similar grades at this point in this season like Ingram, but with Ingram being the longest tenured player on this roster (him and Zubac), I expect more out of a leader and the number two overall pick in his third year. Boyer: Lance Stephenson. He’s helped tilt some games in Los Angeles’ favor, but Stephenson leaves me vexed more often than he does content. It’s no secret that Stephenson has a penchant to be over-the-top in terms of on-court (and off the court for that matter) theatrics, which has led to many mindless moments, including a bevy of exasperating turnovers. Stephenson’s numbers, 7.7 points, 3.4 rebounds and 1.8 assists per game in 15.2 minutes of action, aren’t too shabby when you take into account the amount of time he actually sees the floor, but this is the key metric when it comes to Mr. Make ‘Em Dance: he has 40 assists this season, yet 26 turnovers, a ratio that isn’t fetching to the Lakers and their coaching staff. While Stephenson does have his moments, he’s been too erratic for a guy that was billed as an essential offseason pickup for the Lakers, and that’s why he gets my lowest grade. Allen: Kentavious Caldwell-Pope earns my lowest grade. He’s the Lakers’ supposedly “knockdown shooter” and he has struggled thus far this season. It hasn’t just been him. The team as a whole has struggled from the outside and we all knew they needed shooting but I expected a lot more out of Caldwell-Pope. Shooters should thrive off of James and this just proves that the Lakers need a more bonafide shooter. 3. What has been your favorite Laker moment this season thus far? King: It also comes from LeBron James, but rather it was his deep three-pointer versus San Antonio at home that tied the game and sent it into overtime. He initially called a time-out but was ignored by the refs (thankfully), then calmy just dribbled it up the court with the seconds ticking down only to pull up from a few feet behind the line and just snapped the bottom of the net. While the Lakers did not win that game, it was my initial moment of ‘wow, the Lakers actually have LeBron and I am lucky he is on our side’. It felt ‘Kobe-esque’ when it happened and it gave me pride and reassurance as a Laker fan, knowing that things are going to be okay, now that we got 23 rocking the purple and gold. No timeout, no problem. Bron ties it up with the DEEP three. Boyer: My favorite moment thus far has to be James’ 51-point outburst vs. the Miami Heat on Nov. 18. Los Angeles was fresh off the heels of an embarrassing 130-117 road thrashing handed out by the Orlando Magic, a contest in which James scored 22 points on a (by his standards) pedestrian 42% shooting. We all knew James returning to Miami, where he won his first two NBA championships, coupled with the fact that the Lakers took a clobbering that I’m sure left James miffed, would spell for some fireworks, but not to the tune of 51 points. Yes, Miami was short both Goran Dragic and Dwyane Wade, but I don’t think their presences would’ve altered the outcome of this one much. James was incendiary, shooting 61% from the floor, including 6-8 from three-point land. Don’t be surprised to see more performances like these from James as the season rolls out and Los Angeles finds it of the utmost importance to eke out wins in order to improve their playoff standing. It’s refreshing to have a player on the roster again who can seemingly issue statements like this on command. Allen: I would have to agree with BJ. While I’ve found myself frustrated with James at times his 51-point performance was very remarkable. It was just one of those games where he could do no wrong and everything he put up went in. He couldn’t be stopped and it felt good to see a Laker having a defining night. What made it even better was his last deep three to put him over 50. 4. 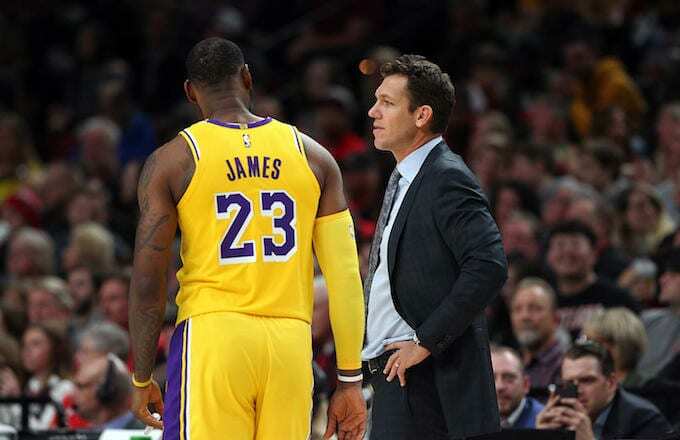 With the reports that LeBron James has been abandoning the playcalling of Luke Walton, would you say that there this is something or nothing to make of this? Boyer: Nothing. These are the narratives that get conjured up when you get LeBron James playing in Los Angeles for the Lakers. James’ intellectual acuity on the basketball court has always been lauded, so why not let one of the keenest minds this game has ever seen call the shots as he sees fit every once in a while? If James is blatantly disregarding Walton’s play-calls than yes, we may have a gargantuan issue at hand, but I highly doubt that’s the degree this thing has reached. Allen: Nothing. This is nothing new for a James led team. There have always been jokes that James coaches his teams ever since the Miami Heat days so what else is new. When it comes to a guy with the IQ of James then I’m sure there are things that he’s seeing out on the floor that he’s looking to attack. I’m sure there is some type of communication between James and Walton on these things. 5. At the quarter mark, the Lakers sit at 13-9 and in sixth place in the Western Conference. What is your updated projected record for the Lakers the rest of the season? King: The brash arrogance and confidence I have in this Lakers team make me want to stay that they can still achieve a 50 win season, however, the realistic and more rational me says that anywhere between 42-47 range is more suiting of this roster. The final projected record is 46-36 for this squad, and they will stay in that sixth spot come playoff time. The month of February will be tough for the Lakers as they will have to play opponents such as the Warriors, Celtics, 76ers, and Rockets with the only home game of those contest coming against Houston. Not to mention the other good teams that lie between those opponents as well (Indiana, Memphis, and New Orleans). There will be an All-Star break that will help us that month in terms of rest but winning those games and taking a majority of them will play a big factor in shaping out how the rest of the season unfolds. In order for the Lakers to continue winning games and achieve the aforementioned projected record, they must continue to do the things that have gotten them to this record this far while also making some adjustments along the way. As far as what has been working for them, pace and scoring. The Lakers have been one of the top teams in both categories all season and are currently ranked 5th in pace and 10th in scoring. The usage of LeBron will also be a factor in the overall record as well in determining if there may be a few games to rest him or conserve his energy for the games he 100% needs to get up for (which unfortunately just might be every game this season). With the play of LeBron, it is clear to see he can get us a long way but it is truly up to the role players like Kyle Kuzma, Josh Hart, Lonzo Ball, and Brandon Ingram to all take it to the next level in their development. No more excuses. Boyer: Going into the season, I was in the “Lakers are going to win 50 games this year,” camp, but the first quarter of the season has me tempering my expectations a little bit. Lonzo Ball’s offensive game remains one of the most uneven for a starting guard in the league, Brandon Ingram hasn’t blossomed into the 20-point scorer we all thought he’d be next to James, and Kyle Kuzma’s impact on the game is hard to pinpoint when he’s not scoring the rock. Ingram, who is currently slotted out of position playing the two-guard, has looked better as of late and Ball remains one of the most threatening defensive players in the league, but there are still some major kinks to be ironed out by Los Angeles. Ones that could possibly be masked over by James’ brilliance on a nightly basis, but Magic Johnson and Rob Pelinka have both been vocal about not wanting that to be the case. Unless a team that is currently in the Western Conference’s thickets reels off a sizable win streak (HELLO GOLDEN STATE), it appears as if squads such as the Lakers, Oklahoma City Thunder, Memphis Grizzlies and Portland Trailblazers will remain separated by two-three games for the duration of the season. I see the Lakers finishing with 48 or 49 wins, which concerns me when it comes to homecourt advantage in the opening round of the NBA Playoffs. 50+ wins I think secures them a first-round Game 7 in Los Angeles if there were to be one, but if there’s one thing we can for sure take away from this team in the first quarter of the season, you never know what you’re going to get besides turnovers and missed free-throws, which makes it hard to identify an accurate win total for this club. Allen: I envision the Lakers hovering around the 45-game mark. While they’ve lost some games that they shouldn’t have, they are not in a bad position. Their chemistry will get better as time proceeds and hopefully, they can add another shooter in the near future. They need outside shooting desperately and the name Bradley Beal sounds real appealing in this situation.